A number of years ago, I asked a friend of mine who hunts with Walker hounds, if he were to get a good all around dog for a ranch or farm, what breed would he choose. 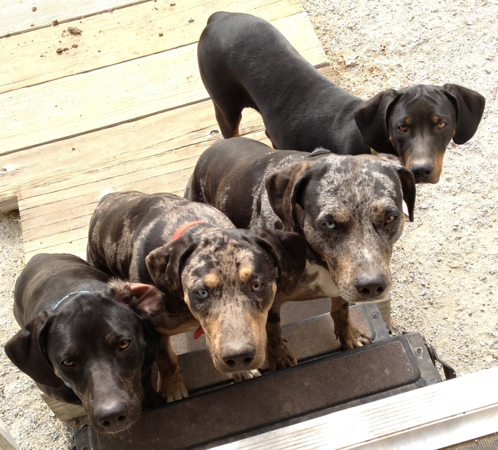 He shot back, 'a Catahoula!'. That was the first time I ever heard the word. I began to read up on them, and attended a hog baying event in Sacramento. I needed a good dog as we have lots of critters up at our ranch. A little while later, in July of 2007, I made decision to purchase a pup from Livewire Catahoulas near Lodi, and on July 20th, 2007, Baby came into our lives. Wife added the name 'Beignet'... since she's Louisiana bred. A beignet, of course, is a French donut!! !